John Williamson is Research Associate in the AHRC/ESRC-funded Musicians’ Union: A Social History project. When Susan McClary delivers this year’s Cramb lecture on Friday 11th March, she will be following in a long line of distinguished scholars, composers and critics. First established in 1923, the lectures had convinced the University authorities of the viability of Music as a sustainable area of study, undoubtedly influenced by the calibre of the early guests, not least Gustav Holst in 1926. The Cramb lecture series is named after Susannah (Susan) Cramb, the daughter of a wealthy Helensburgh leather merchant, who was to pass much of her family’s wealth to the development of music education across the higher education field in Scotland on her death in 1911, with music at the University of Glasgow being one of the major beneficiaries. Cramb was the last survivor of the seven children (six sons and a daughter) of David Cramb. Both she and her siblings had shown considerable interest in both their hometown and education prior to her death. For example, Susan’s brother, John, had been involved in both the local education board and in providing the land for the original building of the Hermitage Public School, which had opened in the town in 1880. By the time of Susan’s death in 1911 it had been decided that much of her family’s wealth was to be bequeathed for educational purposes. 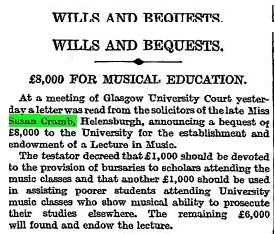 The Times reported on 12th May of that year under the headline ‘£8000 for Musical Education’ that the (Glasgow) University Court had received the funds from the solicitors looking after Cramb’s estate for ‘the establishment and endowment of a lecture in music’. The report went on to specify that of this ‘£1000 should be devoted to the provision of bursaries to scholars attending the music classes and another £1000 should be used in assisting poorer students attending University music classes who show musical ability to prosecute their studies elsewhere’. It went on to stipulate that the remaining £6000 be used to ‘fund and endow’ the lecture. The scale of the donation can perhaps be best understood by thinking of it in terms of the value of £8,000 in 1911 in today’s money – over £800,000. The outbreak of the First World War was one of a number of factors that contributed to a lengthy delay before the eventual launch of the lecture series in 1923. The format had been agreed as a series of ten lectures by a distinguished composer, musicologist or critic to be held at the University on Fridays and Saturdays during January and February of each year. The lectures were advertised as being ‘illustrated’ by local musicians and were to attract not only large audiences from both within the University but also the wider public. They also attracted considerable attention from the press. In the early years of the lectures, they were reported in some detail not only by musical journals, but also the Scottish press. The Glasgow Herald and The Scotsman both reliably relayed the main points of each lecture in the following day’s paper, albeit in the typically dry style that characterised news reports of the time. Nevertheless, these help paint a detailed picture of the Cramb Lectures in the period prior to the Second World War. Such attention was drawn by the status and calibre of those who delivered the lectures in the first few years of the series. Sir Percy Carter Buck, who at the time was music director at Harrow School and who was subsequently appointed King Edward Professor of Music at the University of London, was the first appointment. His 1923 lectures focused on the state and nature of music education in Britain and were subsequently published in a book, ‘The Scope of Music’. His immediate successors in the post – Sir Henry Davies (Professor of Music, University of Wales in 1924) and Donald Tovey, the Reid Professor of Music at the University of Edinburgh) – were held in equally high esteem, though the Musical Times noted that Tovey’s lectures ‘were less popular in manner and matter than those of previous lecturers’ (1 June 1925: 552). Two years later the same journal reflected on the growing influence of the lectures noting that ‘what Sir Thomas Gresham did for London past and present, Miss Cramb has done recently for the present for Glasgow’ (1 March 1927: 238). It went on to claim that ‘the Cramb Music Trust lectures have brought to the University of Glasgow during the past five years a series of lectures, all of the greatest importance because of the fresh outlook and high standing of the annual visiting speakers’ (ibid). By the time of this reflection, the fourth and fifth lectures had been delivered by Gustav Holst and Henry Colles respectively, the former’s visit to Glasgow attracting the most attention in the Scottish newspapers. Holst, who was then employed at the Royal College of Music, was already a well-known and established composer and had connections with the city. Holst’s lectures were based around the theme of the orchestra – with the Friday lectures focusing on the different elements of the orchestra and the Saturday ones relating to specific composers and works based on a series of Scottish Orchestra concerts which were taking place concurrently at the St. Andrew’s Hall. The lectures, which took place in the University’s Hunter Halls were illustrated by a number of local musicians – ‘vocalists, pianists and members of the Glasgow Bach Orchestra’ (Musical Times, 1 March 1926: 238) and introduced by the University’s Principal, Sir Donald MacAlister. He highlighted the composer’s previous connection with the city when he spent time as second trombonist in the Scottish Orchestra between 1900-4, and, according to the Musical Times, the ten lectures ‘drew crowded audiences on each occasion’ (ibid). If the press reports are to be believed, Holst’s Saturday lectures were something of a cheerleading session for the Scottish Orchestra and their programme, with perhaps the most insightful of them being his reflections on his own work, The Planets. For example, he defended Brahms against the accusations that his work was ‘too thick, too many instruments being used for too long a time, the scoring was laboured’ and that ‘the sun never shines on Brahms’ scoring’ (The Scotsman 18 January 1926: 5) by comparing it with the production of art in Glasgow. ‘As far as he knew the sun never shines in Glasgow’, continued The Scotsman report, ‘and yet Glasgow had a school of painting which had produced very famous artists; and people could learn to paint and produce good paintings although their country did not get much sunlight’ (ibid). So for Holst, Brahms’s Variations on the theme of Haydn was ‘perhaps the most wonderful thing that he ever wrote’ (ibid). He was similarly effusive, in other lectures, about Mendelssohn’s Midsummer Night’s Dream which has been performed the previous night by the Scottish Orchestra under Sir Thomas Beecham (‘a neglected work . . .the best thing he ever did, except perhaps his Hebrides’), Ravel (‘a master of subtle effect’) and Beethoven, whose Seventh Symphony was ‘one of the masterpieces of the world’. When it came to his own work, Holst’s reflection on The Planets centred on two issues – debates around whether it was a modern work and what The Guardian described as ‘Mr. Holst’s Grievance’ (8 February 1926: 8) – his plea for it to be performed in its entirety. On the former, he claimed not to be interested in whether his work was seen as modern or old, but instead described his work ‘distinctly out of date – it was old-fashioned; it was pre-War’ (ibid) and dismissed theories that Mars had been written on the outbreak of the First World War. He clarified that he had all of The Planets ‘fixed in his mind before 1914, and the only thing he did begin to think of in 1914 was Venus’. Holst also noted that only three of the seven movements of The Planets were to be performed by the Scottish Orchestra and noted that the majority of the performances to date had only featured three or four of them. Famously, Sir Adrian Boult, who conducted one of the first public performances of the work, used only five movements (Mars, Mercury, Saturn, Uranus and Jupiter) arguing that the public were being given ‘a new language’ (Kennedy 1987: 68) and ‘half an hour would be as much as they could take in’ (ibid). Although Holst admitted that this was partly his own fault (and he had conducted incomplete performances himself), he complained that ‘the performance of the seven pieces of The Planets produced an effect which was not obtained, but was totally contradictory when there or four were performed’ (The Scotsman, 8 February 1926: 2). Most frustrating for the composer was when selections ended with ‘Jupiter’ – giving the piece a happy ending and not that which he associated with the complete cycle. He highlighted that there had been complete performances in London, Birmingham and Sydney but noted that there had yet to be a complete performance in Scotland – though qualified this to laughter from the audience by claiming that ‘he was grateful to have performances of the work at all’ (The Guardian, 8 February 1926: 8). Holst’s final lecture in the series saw him taking questions from the audience on the subject of orchestras. Here he highlighted not only their significance in ‘every form of music’ (The Scotsman, 15 February 1926: 9) but argued that their importance could ‘not be overrated’ (ibid). Referring to the orchestral situation in Britain in 1926, he worried about the best orchestral musicians were leaving for the USA but praised the Scottish Orchestra, hoping that ‘the time might come when the Scottish orchestral season might last for six months’ (ibid). 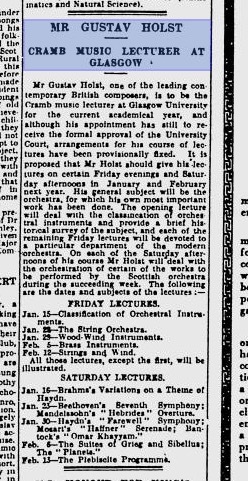 Though this may have been wishful thinking, there was little doubt that Holst’s lectures and the Scottish Orchestra’s concerts had a significant impact, not least on music in the University. demonstrated that it was practicable to carry on within the University a department of music, which should not be academic or theoretic only, dealing with mere history, or mere grammar or mere aesthetics, but dealing with the very stuff of music itself, treating it both systematically and practically, as the subject-matter of languages and literature and science was treated in their respective departments (ibid). To what The Scotsman described as ‘loud applause’, he predicted that Holst’s contributions had brought both a Professorship and Faculty of Music at the University ‘sensibly nearer’ (ibid). To varying degrees Holst, MacAlister and the late Miss Cramb saw their wishes granted over the coming years. Holst was back in Glasgow at the end of 1926 conducting the 5SC Station Symphony Orchestra (the precursor of the BBC Scottish Symphony Orchestra) for the first complete Scottish performances of The Planets at the St. Andrew’s Halls, though the Glasgow Herald reported poor ticket sales. The University also got its Professor of Music in 1930 and had a fully functioning Music Department with the ability to confer degrees from the start of the 1932-3 session. Here Cramb’s legacy again played a part. The Professorship was part of a wider scheme to expand the study of music in Scotland and in 1926 the front page of the Glasgow Herald launched an appeal to raise the remaining funds for the founding of a Scottish National Academy of Music and a Professorship of Music at the University of Glasgow, with the intention being that the Professor would also be the Principal of the Academy. The appeal noted that of the £92,000 required, ‘the trustees of the late Miss Susan Cramb had arranged to provide the £20,000 required for the foundation of the chair’ (Glasgow Herald, 27 October 1926: 1). Though the initial plans were for a Cramb Professorship, these were superseded in 1928, when a gift of £20,000 was received from businessman, Sir Frederick Gardiner and his brother, William, towards a Professorship in Music. This allowed assisted the raising of funds for the wider project and the Sottish National Academy of Music (later to the be the Royal Scottish Academy of Music, the Royal Scottish Academy of Music and Drama and, since 2011, the Royal Conservatoire of Scotland) opened in 1929. In the same year, William Whittaker, a composer and renowned Bach scholar from the North-East of England was appointed its first Principal and to the position of Gardiner Professor of Music at the University, posts he commenced on the 1st January 1930. Whittaker himself gave the Cramb Lectures in 1931 and remarkably, some eighty-five years later, the name of both the Gardiners and Susan Cramb remain prominent in University music circles. Though the Cramb lectures were interrupted by the Second World War and reduced in scale from ten lectures to two in 1947, Cramb’s generosity and vision continued to support bringing an array of leading names in the music world to Glasgow in the post-War period, among them Erik Chisholm (1957), Peter Pears (1961) and Aaron Copland (1962). The first woman to give a Cramb lecture was the Scottish born (but then living in the US) composer Thea Musgrave in 1977, some fifty-four years after the series began. Tellingly, there have been more female Cramb lecturers in the twenty-first century so far than the whole of the twentieth. As it nears it centenary, the history of the Cramb Lecture offers something a snapshot of musical life in the University through that period, but also reflects wider changes in the music – and the study of it – both nationally and internationally. In doing so and surviving in spite of the massive changes in both music and universities, the lecture series has gone a long way to fulfilling at least part of Susan Cramb’s legacy. Coinciding with the 2016 Cramb Lecture in Music, a microsite has been launched celebrating the history of the lecture series.